Have you ever had a dish that just sounds good, and so you go through a streak where you eat it all the time? Pad Thai has been that dish for me lately. I’ve been making it once a week for the past month. It has just been hitting the spot! If you’re not already familiar with pad Thai, it’s a Thai stir-fried noodle dish made with dried rice noodles that are soaked in warm water and then stir-fried with eggs, some type of protein, some veggies, and flavored with a sauce made from tamarind pulp, fish sauce, palm sugar, and Thai chili powder. 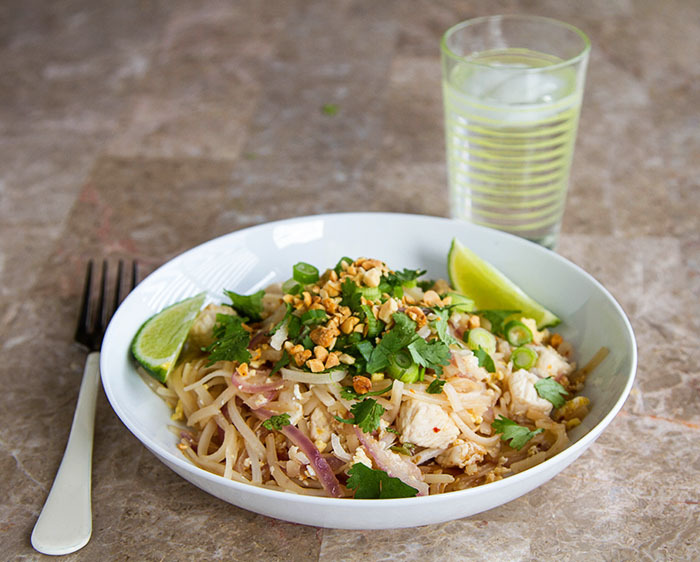 I love pad Thai, because it’s flexible—depending on what I feel like eating and what I have on hand, I can make it using chicken, shrimp, or tofu, and I can throw in whatever veggies I have laying around. In addition, it only takes about 15 minutes to make, which makes me ultra happy. Last week I had some friends over for lunch and served chicken pad Thai, along with a Thai cucumber salad. I posted a picture of the meal on Instagram and had so many requests for the recipe, that I decided I would share it here with you. Then life got in the way. You may have noticed that things have been a bit quite around here. I have not been feeling so hot, and by the end of last week I decided that enough was enough, and hauled myself over to see the doctor. After several vials of blood being drawn, my test results came back at the beginning of this week: Mononucleuosis. What? I had to laugh. I have ‘the kissing disease” after having been married for almost 12-years to Mr. Fuji? Life is funny sometimes, isn’t it? After I had a good chuckle I went back to bed, which is where I’ve been hiding ever since, until yesterday morning when my pad Thai cravings returned with a vengeance. The cravings seemed to dig up a new reserve of energy, and so I hit the kitchen, bringing my camera with me, so that I could share with you. 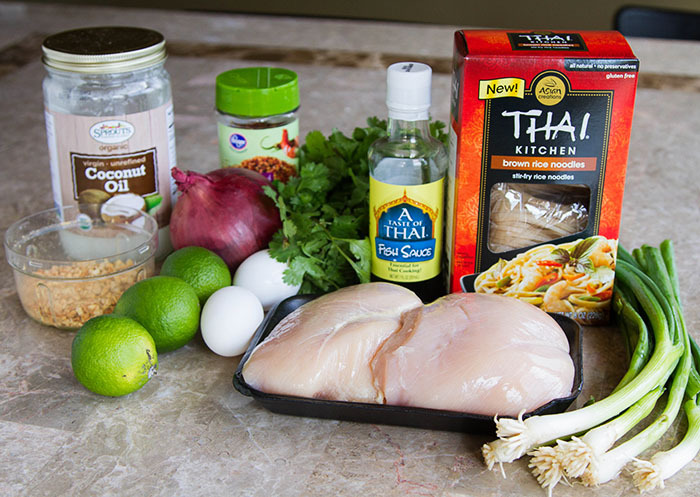 This recipe is not a truly authentic pad Thai recipe, since I don’t use some of the more traditional ingredients like tamarind pulp, palm sugar, or Thai chili powder in my sauce, as all three of those ingredients would require a special trip to an Asian market to find. I substituted lime juice for the tamarind pulp, honey for the palm sugar (though you could use brown sugar or granulated sugar if you want), and crushed red pepper flakes for the Thai chili powder—all things that are readily available in all of the supermarkets near our house. I also whipped up a Paleo version, while I was in the kitchen, curious to see what the changes would do to the final dish. I made zucchini noodles using my spiralizer, which I substituted for the rice noodles, and then substituted roasted almonds for the peanuts to garnish the finished dish. It was fabulous! You get a bit more crunch and less chew with the zucchini noodles, but still delicious with the same sweet, sour, and salty flavors that made me fall in love with pad Thai in the first place. 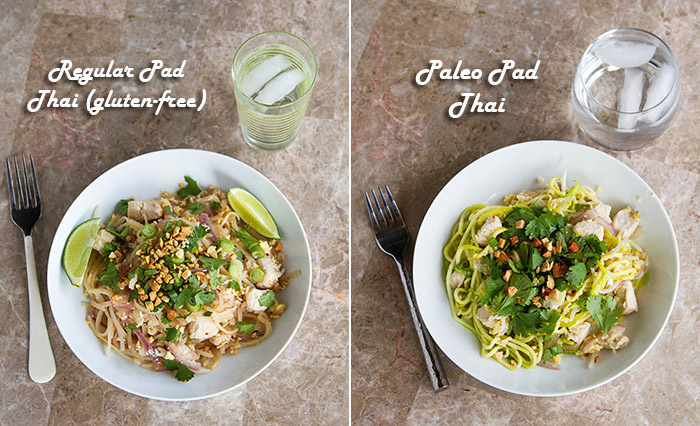 Either way, pad Thai is totally what I needed yesterday. 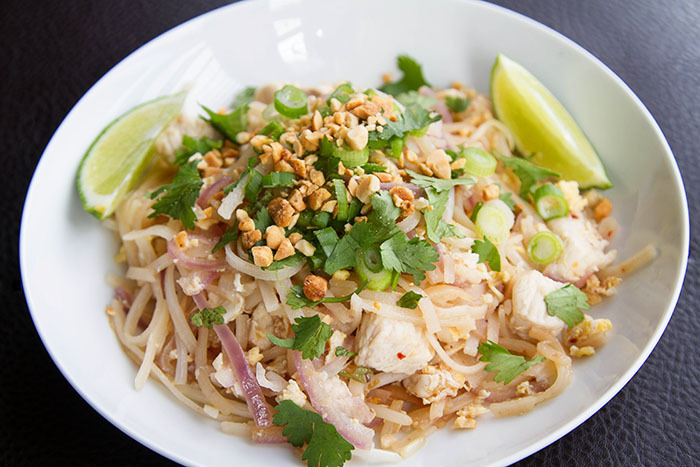 Although chicken soup may have healing properties, chicken pad thai is currently the soothing balm for this tired soul. 1. Whisk all of the sauce ingredients together, then set the sauce aside. 3. 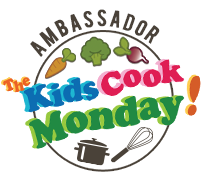 Heat 2 tablespoons of the coconut oil in a wok or large saute pan over high heat. When the oil starts to shimmer, add the chicken, red onion, and garlic. Stir-fry until the chicken is cooked through, then remove the chicken mixture to a bowl and set aside. 4. Add the remaining 2 tablespoons of coconut oil to the wok. When it starts to shimmer, add the beaten eggs and scramble them. Then add the sauce and drained noodles. Toss everything together until it is well mixed, then add the bean sprouts. 5. Garnish with the roasted peanuts, scallions, cilantro, and lime wedges. Serve immediately. *Make it Paleo! 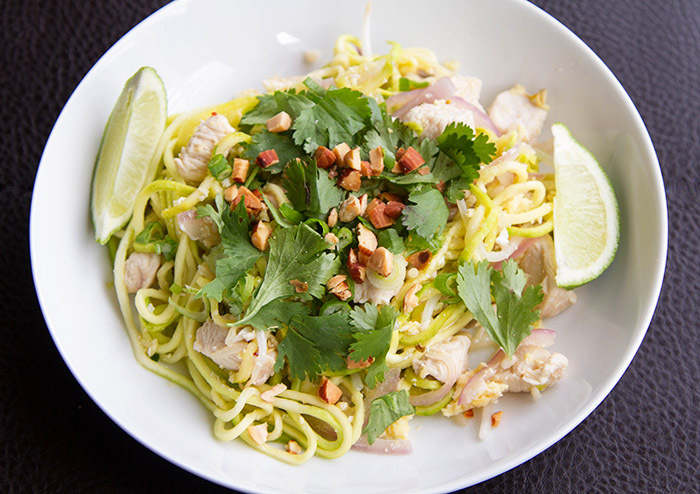 To make it paleo, substitute the brown rice noodles with zucchini noodles, and use roasted almonds instead of peanuts as a garnish. To make the zucchini noodles, use 2 pounds of zucchini (approximately 4 large zucchini). Slice the ends off the zucchini, and peel them. 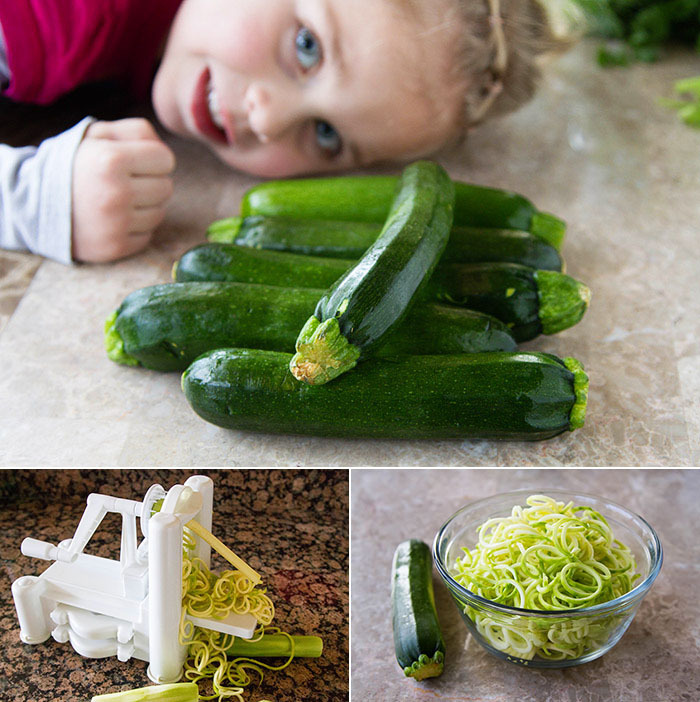 Then, using a spiral slicer, mandoline, or julienne peeler, turn the zucchini into long noodles, discarding the center seeded portion. Set the noodles aside until ready to use in step 4. *Recipe Notes: If you are gluten-free, make sure you check the ingredients on the fish sauce that you buy. Some may contain gluten. 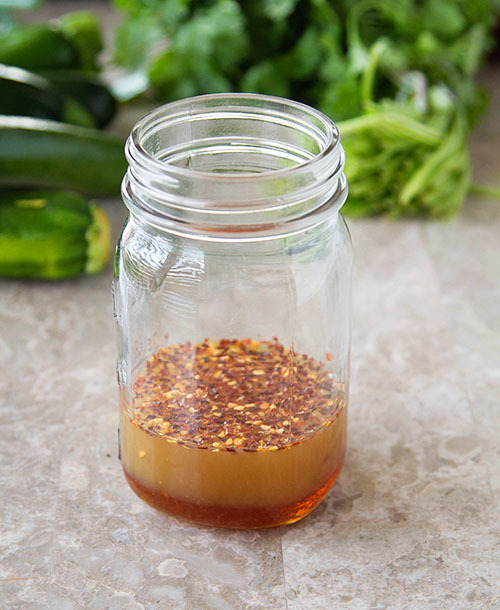 I usually use A Taste of Thai fish sauce, which is easy to find in my local supermarkets, and is gluten-free (and MSG-free!). 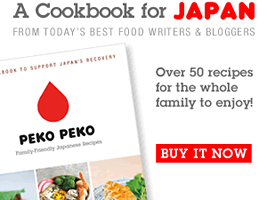 If you are vegetarian, replace the fish sauce in the sauce with soy sauce, and use tofu instead of chicken. I have as well! This is just the way I learned in Thailand. I was just using the sauce ingredients as examples of what can be different in an authentic pad Thai! 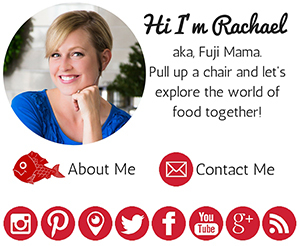 I tried to use things that are commonly found in our local grocery stores…things like tamarind, dried shrimp, etc. are definitely harder to find around here! I love Red Boat fish sauce…though I love 3 Crab too! This looks super good. I’m making my shopping list now. It’s been years since my last Pad Thai binge! Now I need a big bowl ASAP! Thanks for sharing. Sorry to hear your not feeling well. I think that sometimes we run ourselves into the ground and are the in denial about how sick we are and so our immune systems need a break……. Oh, maybe that’s just me :/ feel better & rest up! LOL, isn’t that the truth? consider. The spiral slicer or Spiralizer makes not only a great gift for health enthusiasts but those who like to be creative with their cooking. Make sure to head on over to the site right away so you would not lose out on this offer.